He was claimed to be the most photographed animal of all time (even appearing on the front cover of dance music duo Basement Jaxx’s album Rooty), and he was indisputably one of the animal kingdom’s greatest, most readily recognisable icons. 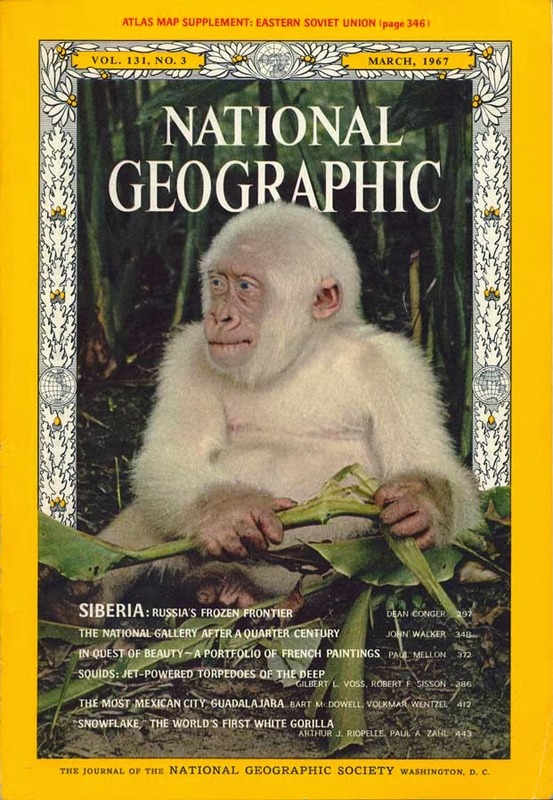 He died 10 years ago this week, so here (first published in Fortean Times shortly after he died, but now expanded and updated in ShukerNature) is my tribute to Little Snowflake – the world’s only known white gorilla. 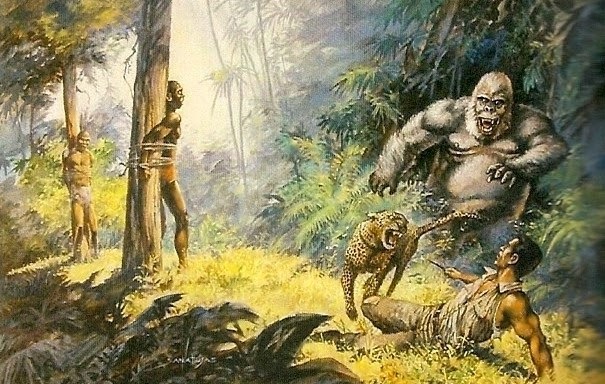 As any cryptozoologist will confirm, Africa has always been replete with legends of bizarre-sounding beasts – some of which, notwithstanding, have ultimately proven to be real animals hitherto undescribed by science, as with the okapi, giant forest hog, and pygmy hippopotamus. 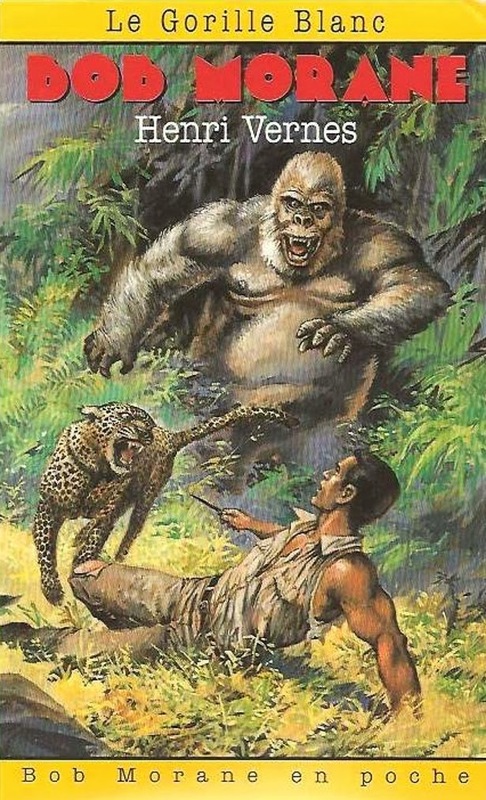 Far more unlikely even than these, however, must surely be various ancient native legends of huge ghostly gorillas with pure-white fur worshipped as jungle deities. 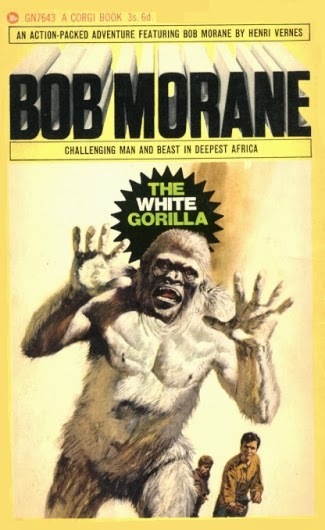 After all, none of these pallid entities had ever been spied by western explorers, so science scoffed at the mere notion of a white gorilla. Conversely, fiction writers and film makers alike were captivated by this semi-supernatural image, which duly featured in various adventure novels and movies. 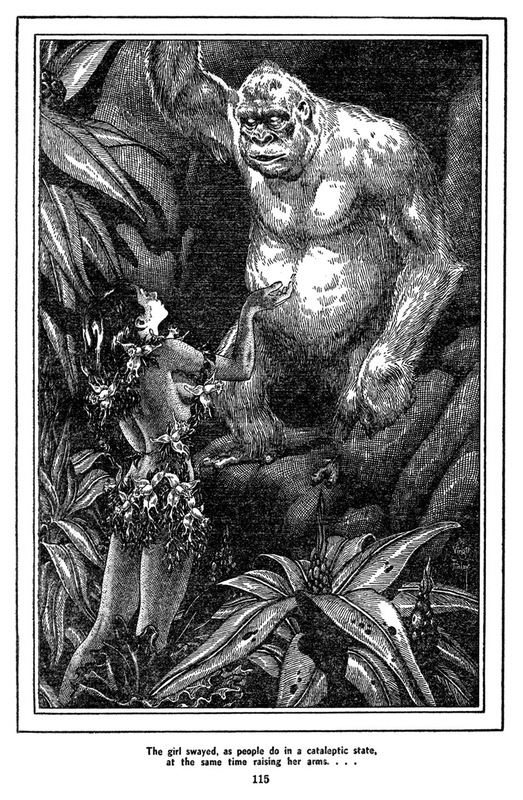 An early example, published in 1915, was written by Elmer B. Mason and succinctly entitled The White Gorilla. 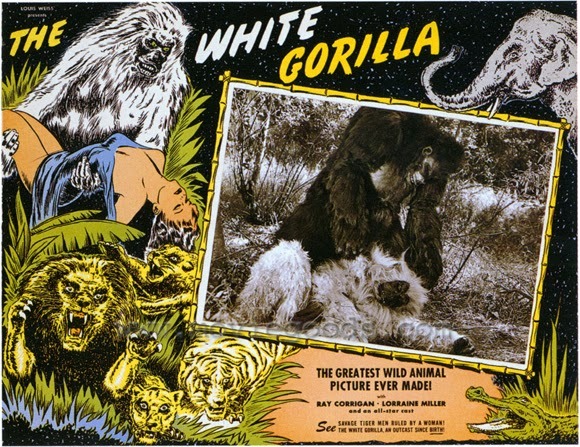 A USAmovie of the same title directed by Harry L. Fraser was released in 1945, and starred stuntman Ray “Crash” Corrigan as an embittered African explorer determined to track down and kill the elusive but ferocious white ape that had previously savaged him. 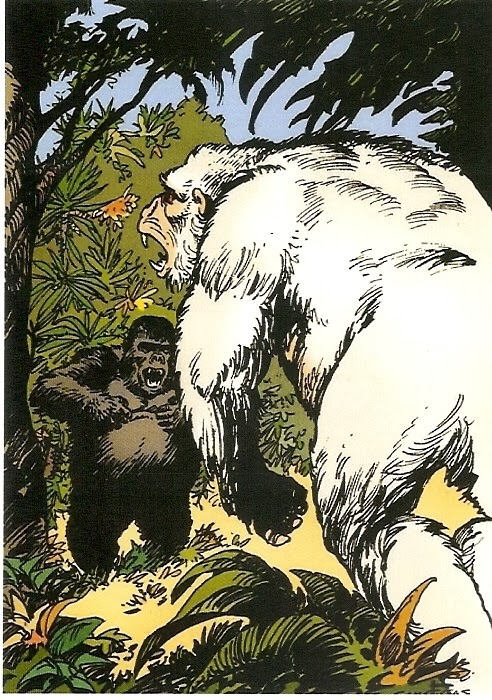 Returning to novels: another one, originally published in French in 1957, was entitled Le Gorille Blancand was penned by famous French science-fiction author Henri Vernes. In 1966, it was republished in English as The White Gorilla, but by an incredible coincidence this very same year ended with an astonishing, totally unexpected discovery that effortlessly transcended and supplanted romantic fiction with truly remarkable fact. On 1 October 1966, amid the dense jungle of the tiny West African country of Rio Muni (a former Spanish colony now part of Equatorial Guinea), an adult female lowland gorilla was shot while devouring bananas within the grove of local farmer Benito Mañé. When warily inspected afterwards, the gorilla was found to be dead, but clinging to her body, its head buried within her deep fur, was a tiny baby gorilla that was still alive. Moreover, as Mañé and the other villagers crowding near to view the corpse and its attached baby could clearly see, this was no ordinary gorilla infant. Mañé’s description of it was as accurate as it was concise: ‘Nfumu! Ngi! – ‘White! Gorilla!’. And indeed it was, covered entirely in snowy-white fur. It was not a full, complete albino, however, because its eyes were bright blue – thus corresponding with the chinchilla albino state exhibited by the white tigers of Rewa and the Timbavati white lions. News of this amazing discovery soon reached Dr Paul Zahl of the National Geographic Society’s Natural Sciences Division, by way of Spanish naturalist Dr Jorge Sabater Pi, who had meanwhile purchased the little gorilla – a two-year-old male – from Mañé for £50. Sabater subsequently spent some time taming the young ape during its sojourn at the Centro de Adaptacion y Experimentacion de Ikunde, sited in Rio Munibut owned by Barcelona Zoo. 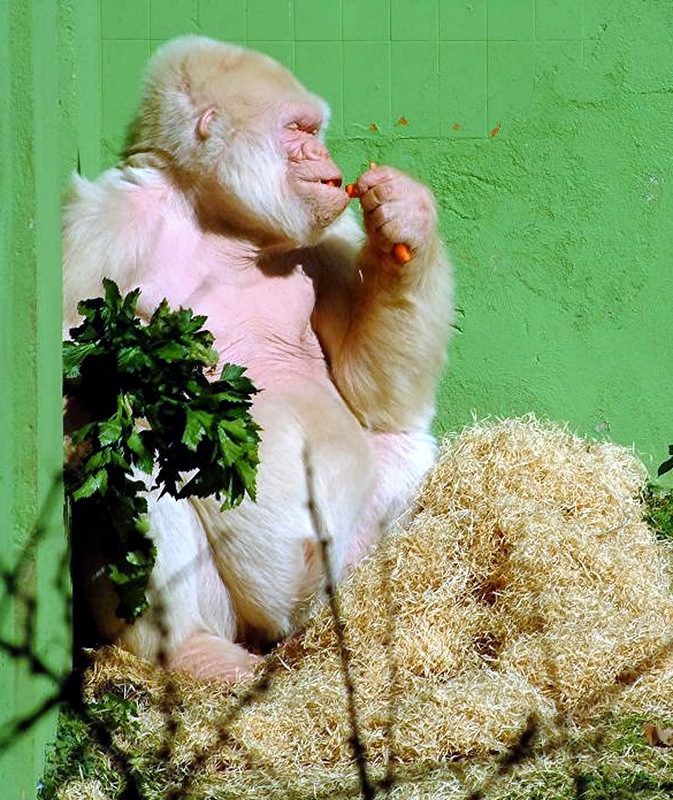 Officially christened Nfumu, this white wonder was soon nicknamed Copito de Nieve – Spanish for ‘Little Snowflake’ – by Barcelona Zoo’s director, Dr Antonio Jonch Cuspinera upon its arrival at Barcelona Zoo. And even though this name inevitably became somewhat incongruous when applied to what eventually became a fully-grown gorilla weighing around 400 lb, standing almost 6 ft tall, and sporting an 8-ft armspan, this is how the people of Barcelona – and far beyond – have popularly referred to their zoo’s most famous inhabitant ever since. Little Snowflake he began, and Little Snowflake he remained. This account seems highly sensationalised, and even if genuine it may simply be that the gorilla was an old individual whose dark hair had become silvered all over, an extreme example of the typical male silverback condition. As for Little Snowflake, his origin was a complete mystery. Although legends of white gorillas have emerged elsewhere in Africa, ironically there are no such myths prevalent in or around Equatorial Guinea, for the local villagers were just as astounded by his discovery as the scientists. 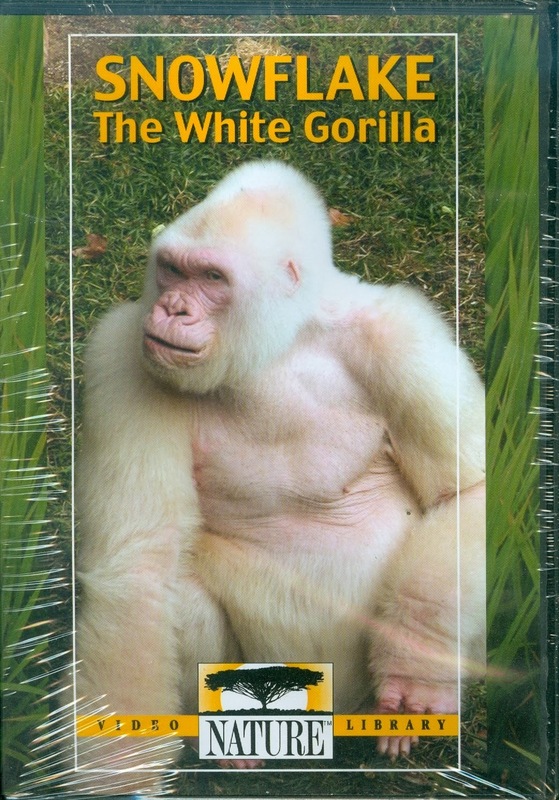 Moreover, with no indication of any previous white gorillas in the area from which he could have inherited the two copies of the recessive mutant allele (gene form) needed to produce his pallid colouring, for many years scientists assumed that it may well have arisen via a spontaneous mutation, thus originating with Little Snowflake and lacking any genetic precursor (but see Postscript at the end of this ShukerNature post for new findings relating to the genetics responsible). 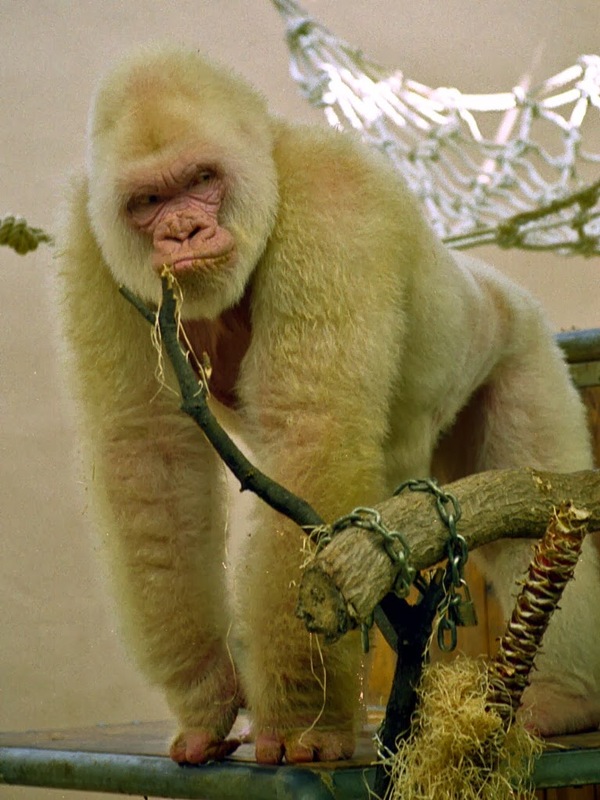 Consequently, zoologists at Barcelona Zoo hoped that by breeding Little Snowflake with normal gorillas at the zoo, the exceedingly rare recessive gene responsible for his unique appearance may be perpetuated, and that in the future other white gorillas may be born. As yet, however, this has not happened, but he was nothing if not obliging, having mated with three different female gorillas and sired no less than 22 offspring, all normal-coloured. Whereas in the wild his white fur would have made him dangerously conspicuous, in captivity Little Snowflake’s dazzling pelage posed no problems for him – at least, not initially. However, he did suffer from a common complication associated with albinism – photophobia, a marked visual sensitivity to bright light. Tragically, by 2001 he had developed another, much more serious condition that again may well have been due to his albinism – skin cancer. Little Snowflake, of course, lacked any melanin in his skin, the dark pigment that acts as a shield against the sun’s harmful ultraviolet rays. For a time, he responded to treatment, but by late September 2003 zoo officials were sad to announce that his condition had progressed to a terminal state and that Little Snowflake, by now roughly 40 years old, had only a few months at most to live. Faced with the shattering news that he was dying, thousands of Barcelona’s people visited Little Snowflake each day, paying their respects to one of their city’s greatest stars and symbols. And in the early hours of 24 November 2003, Little Snowflake quite literally melted away, euthanised peacefully while asleep by the zoo’s vets to spare him any further suffering. Farewell, Little Snowflake. The world will be a duller place without your unique glory, but your essence lives on in each of your many offspring, and one day the great genetic lottery may create more white gorillas in your image, to astonish and enchant all over again (but, hopefully, without resulting in skin cancer). POSTCRIPT:In June 2013, after sequencing Little Snowflake’s genome during the previous year from a sample of frozen blood taken before he died, a team of Spanish researchers (led by Tomas Marques-Bonet from the University of Pompeu Fabra) announced that their results indicated he was very inbred, because his parents shared 12% of their genome, suggesting that they may well have been uncle and niece. This inbred condition may in turn have caused the mutant allele responsible for his white colouration (now known to be the allele SLC45A2) to have surfaced. And finally: more xenobiology than cryptozoology, and apes in name only, but wonderful all the same – here are the white apes of Barsoom as featured in the excellent 2012 Disney movie ‘John Carter’, which I thoroughly enjoyed when watching it last Christmas, and which was based upon A Princess of Mars – the first book in the Barsoom series of novels by Edgar Rice Burroughs.